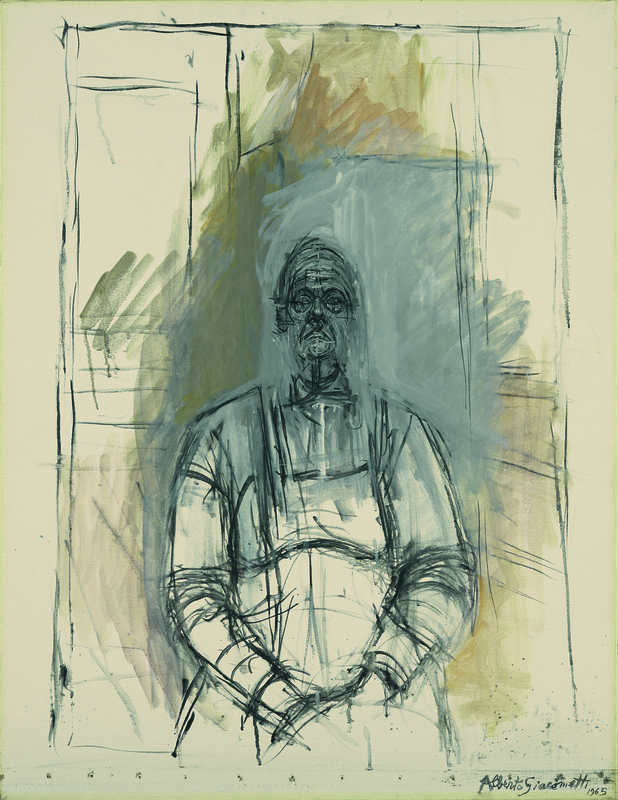 The painter and sculptor Alberto Giacometti belonged to a generation marked by the pessimism and anxiety of experiencing the crisis of two wars. This feeling took the form of existentialist thought, a new moral which, in the field of art, led creators to reflect — sometimes violently — on alienated, tormented mankind. Influenced by this existentialism, Giacometti contributed to shaping a new image of contemporary man through the new patterns of freedom of expression derived from both Expressionist gesture and Surrealist automatism. Jean-Paul Sartre himself considered Giacometti’s solitary figures to be a perfect translation into sculpture of his ideas on the loneliness and incoherence of the human condition. The present Portrait of a Woman, painted in 1965, repeats the same pattern found in most of Giacometti’s portraits, in which the artist systematically dispenses with all narrative references. The half-length figure placed in the centre of the composition stares straight ahead in a hieratic pose, amid a space that surrounds her in such a way as to render her physical presence spiritual. The sitter has not been identified, as Giacometti’s faces ceased to be recognizable elements, and he transmits a mask-like inexpressiveness and silence that makes identity inaccessible. The figure has been eroded, deleted, reduced to the plastic expression of what the artist considered to be man’s existential condition in the modern age. The range of grey and ochre tones and the sketchy technique reinforce the feeling of the isolation of the figure, which conveys a powerful spirituality. The spatial structure, a sort of claustrophobic cage in which the figure is immobilised, is barely drawn in a brief sketch of the studio setting where the portrait is painted. This immobility and hieratism, this aspiration to find an absolute plastic solution to the creation of an archetype, has sometimes led Giacometti’s evanescent figures to be compared to those Paul Cézanne painted of his wife Hortense. The changeless pattern of his portraits repeats, with slight variations, the equally inalterable composition of the numerous portrayals of Madame Cézanne, in which the master of Aix, in addition to eliminating any trace of spatial depth, portrays the sitter with a very powerful presence, but without expressive eloquence in order to render any kind of psychological interpretation impossible.